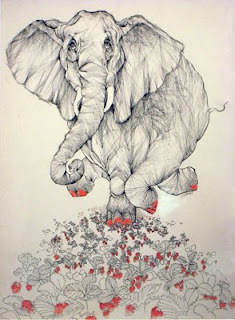 “Elephant Hiding in a Strawberry Patch” by Evelyn Leavens. Make a list of three attainable things that give you daily joy. Open your calendar and find a place to fit each joy. Set your own joy pace, but we suggest once or twice a week, at least. Which made me think of the joke about why the elephant painted its nails red and instantly brought me a tiny burst of joy because I could remember the punchline! I’ll keep you posted on my progress. Wanna join me for the joy ride? Previous post: Hue are you?